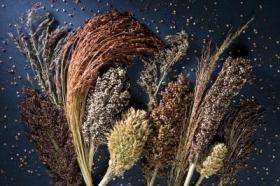 Scientists at the U.S. Department of Energy (DOE) Joint Genome Institute (JGI) and several partner institutions have published the sequence and analysis of the complete genome of sorghum, a major food and fodder plant with high potential as a bioenergy crop. The genome data will aid scientists in optimizing sorghum and other crops not only for food and fodder use, but also for biofuels production. The comparative analysis of the sorghum genome appears in the January 29 edition of the journal Nature. Prized for its drought resistance and high productivity, sorghum is currently the second most prevalent biofuels crop in the United States, behind corn. Grain sorghum produces the same amount of ethanol per bushel as corn while utilizing one-third less water. As the technology for producing "cellulosic" (whole plant fiber-based) biofuels matures, sorghum's rapid growth--rising from eight to 15 feet tall in one season--is likely to make it desirable as a cellulosic biofuels "feedstock." "This is an important step on the road to the development of cost-effective biofuels made from nonfood plant fiber," said Anna C. Palmisano, DOE Associate Director of Science for Biological and Environmental Research. "Sorghum is an excellent candidate for biofuels production, with its ability to withstand drought and prosper on more marginal land. The fully sequenced genome will be an indispensable tool for researchers seeking to develop plant variants that maximize these benefits." "Sorghum will serve as a template genome to which the code of the other important biofuel feedstock grass genomes--switchgrass, Miscanthus, and sugarcane--will be compared," said Andrew Paterson, the publication's first author and Director of the Plant Genome Mapping Laboratory, University of Georgia. "I expect our improved understanding of the sorghum genome to have a major impact on the development of improved bioenergy crops for the emerging biofuels and renewable power industries," said Neal Gutterson, President and Chief Executive Officer of Mendel Biotechnology. Sorghum's is only the second grass genome to be completely sequenced to date, after rice. With approximately 730 million nucleotides, sorghum's genome is nearly 75 percent larger than the size of rice. Researchers used the whole genome "shotgun" method of sequencing first pioneered in the Human Genome Project. In this method, short random DNA fragments are partially sequenced and then analyzed by powerful supercomputers to reconstruct the original genome sequence. The repetitive sections and the length of the sorghum genome made assembling this "puzzle" a highly challenging computational problem. By comparing sorghum's assembled code with rice's, the scientists were able to provide a "reality check" for rice's previously published estimate of protein coding genes. "We found that over 10,000 proposed rice genes are actually just fragments," said DOE JGI's Dan Rokhsar, the publication's co-corresponding author. "We are confident now that rice's gene count is similar to sorghum's at 30,000, typical of grasses."